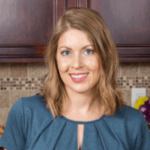 Published: Sep 21, 2017 · Modified: Apr 12, 2019 · By Jen Sobjack · This post may contain affiliate links. 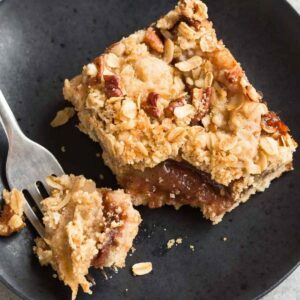 These Apple Streusel Bars are a great treat to satisfy those sweet cravings. This quick and easy dessert recipe takes less than an hour to from start to finish. 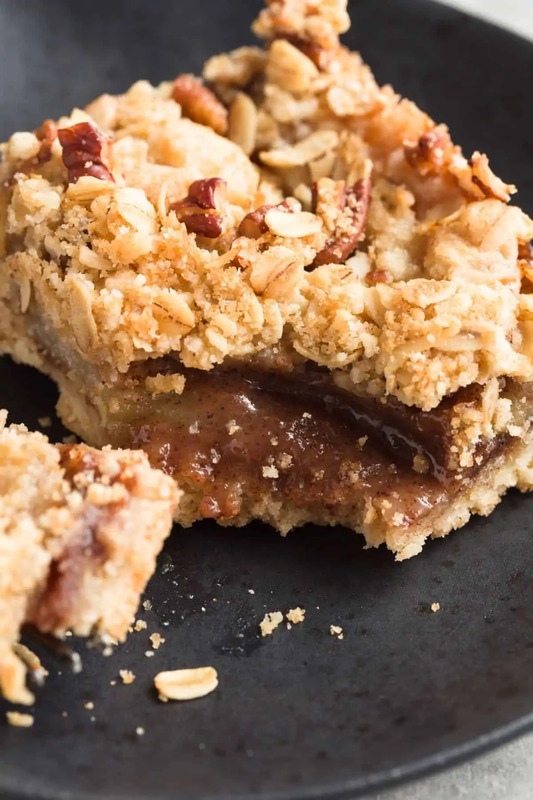 Your friends and family will be impressed with these easy apple pie bars. They have a simple shortbread crust, gooey cinnamon apple center, and a crunchy pecan streusel on top. They are classic comfort food that will bring a smile to your face on a cool fall day. We are closer and closer to fall weather. The evenings are already feeling a bit chilly here. I think I’ve said it many times before, I am not a fan of cooler weather. And winter, you can have it. I do, however, love fall baking. The smell of apples and cinnamon baking is pure comfort. You can often find me whipping up apple spice cupcakes, apple cinnamon scones, or caramel apple pecan streusel pie as soon as the weather cools down. Apple pie is one of my top favorite desserts. It’s actually the very first pie I learned to make. Every year I would bake one for my mom as soon as the weather turned cool. She and I are just alike in the fact that we suffer from wintertime blues and we both favor apple pie. What better way to cheer her up than with her favorite dessert. Hi, mom! 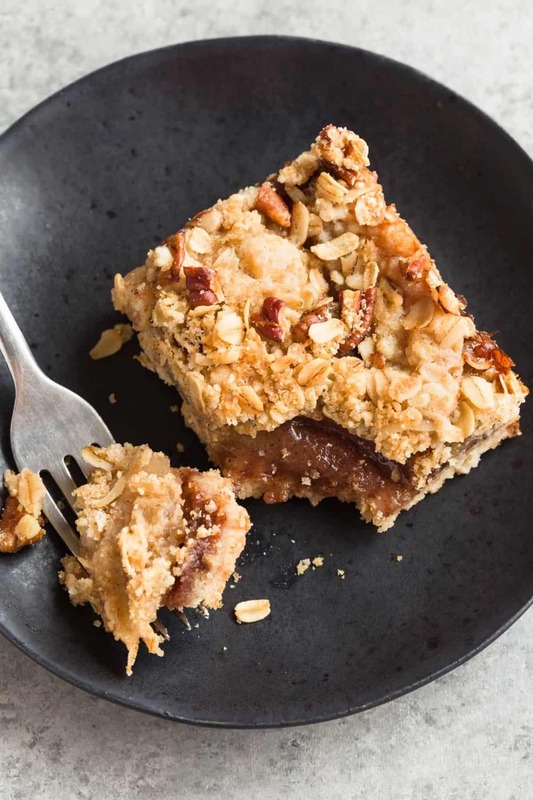 I made these apple pie bars with streusel topping and after one bite I knew the rest needed to go to work with hubs. Seriously, they needed to be out of this house or I’d eat them all. They are that good. Just like a slice of warm apple pie spiced with brown sugar and cinnamon. A crunchy pecan streusel and buttery shortbread cookie crust. Just talking about these bars has my mouth watering. The feedback I receive from hubs’ co-workers was all positive. He said they were a huge hit and I believe it. I’m so excited to share this recipe with you today if you can’t tell. I want you to make them! Seriously. DO IT! These apple streusel bars are easy. As most of my recipes are. The bottom layer is a simple shortbread crust made with flour, sugar, salt, and butter. The crust is buttery and thick. It’s the perfect base because it holds up well under the weight of the apples. The apples are the star of this recipe. I like to use pink lady apples because they are a mix of tart and sweet. You can use any variety you like best. You can even mix it up if you like. You need about five medium apples for the filling. That should yield you five cups of diced apples. And of course, these bars would not be complete without a pecan streusel crust. Some of the crust mixture gets set aside to be tossed with oats, brown sugar, and chopped pecans. So much yum is going on here! Can you freeze apple streusel bars? 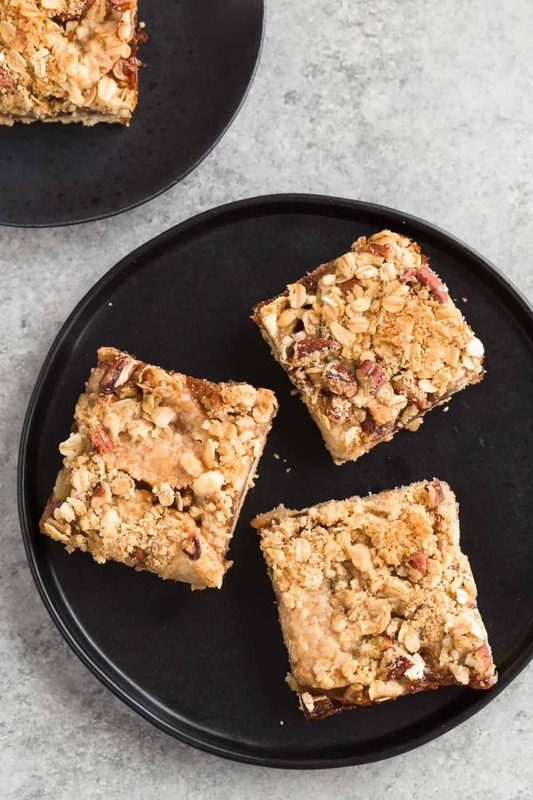 These apple streusel bars are great for freezing. Bake them and let them cool completely. Slice them and wrap them individually in plastic wrap. Place the wrapped bars in a sturdy container with an airtight lid and freeze them for up to 3 months. Thaw them in the refrigerator overnight when you are ready to serve them. You can eat them cold, set them out to come to room temperature, or nuke them in the microwave for a few seconds to warm them up. Preheat the oven to 375°F. Line a 13×9-inch pan with aluminum foil, leaving some excess to overhang. Spray foil lightly with nonstick spray. Make the crust: In a medium mixing bowl, combine flour, sugar, and salt. Stir with a whisk. Using a pastry cutter or fork, cut in the butter until mixture resembles damp sand. Set aside 1 1/4 cups of the dough the topping. Press the remaining dough firmly into the bottom of the prepared pan. Bake for 15 minutes, until lightly golden brown. Make the filling: While the crust is baking, add apples and lemon juice to a large mixing bowl. Stir to coat. Add the brown sugar, flour, cinnamon, and nutmeg. Stir to combine. Pour the filling over the warm crust and spread into an even layer. Make the topping: Add the brown sugar, oats, and pecans to the reserved flour mixture. Stir to combine. Sprinkle the topping over the filling. Bake for 45-55 minutes, until the topping is lightly golden brown and crisp. Cool completely in the pan on a wire rack. Remove from pan by foil overhang. Cut into squares. The bars will stay fresh in an airtight container in the refrigerator for up to 3 days. The bars also freeze well. Cool them completely the slice and wrap them individually in plastic wrap. Place the wrapped bars in a sturdy container with an airtight lid and freeze them for up to 3 months. Thaw them in the refrigerator overnight when you are ready to serve them. You can eat them cold, set them out to come to room temperature, or nuke them in the microwave for a few seconds to warm them up. I like to use Pink Lady apples because they are sweet with a hint of tartness. You can mix and match with a tart variety and a sweet variety for more depth in flavor. Use what you like! You can halve the recipe to fit in an 8-inch square baking pan. Bake for 30-35 minutes.